Chili Garlic Cauliflower Risotto Bowls are an easy Paleo dish to satisfy that comfort food craving! 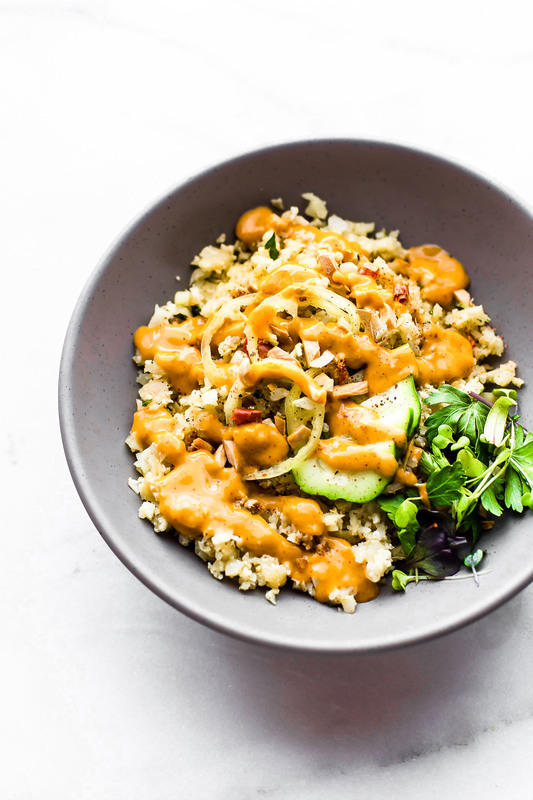 A healthy vegan recipe with a spicy sauce. The Cauliflower Rice makes for the “risotto” and is cooked a non dairy milk (coconut or almond), all in one pan! Then we top it with a spicy sauce made with chili, garlic, and avocado combined. A flavorful, yet simple, meal! 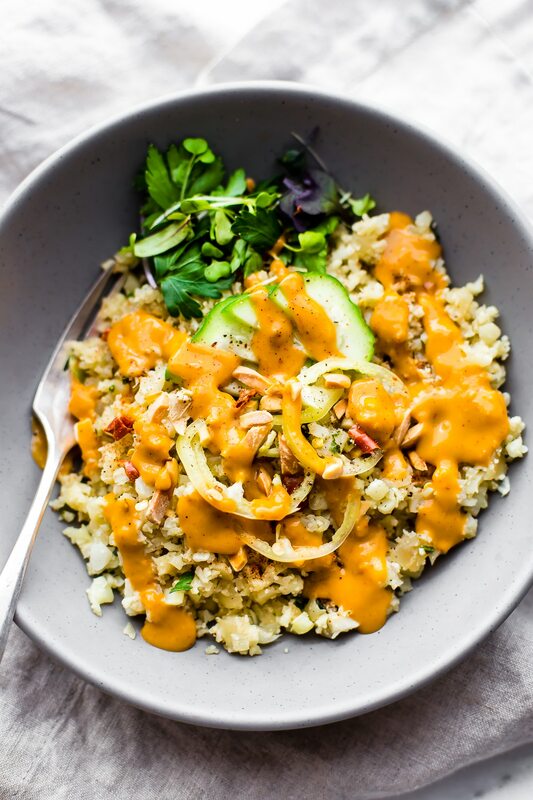 Just letting you know this Cauliflower Risotto Bowls post has been republished with a video and updated content for you! I hope you enjoy. Thank you for following Cotter Crunch Y’all!. Hi there. First things first. I am sharing this recipe because ya’ll, it’s in the COOKBOOK and I get to giveaway 6 cookbooks next week. Which means not only can share a cookbook recipe, but I can GIVEBACK to you all who have supported. THANK YOU! Join me! Yes, come visit my table. Today’s Cauliflower Risotto Bowls are waiting. This is a Cotter Crunch guiltless gourmet special ya’ll. Guiltless as is …. No performing. No pretending. No proving ourselves. PRESSURE Free zone. Just goodness and a bowl of spicy “risotto-ish” goodness. That being said, these are pretty guilt free when it comes to classic comfort food. Just sayin.. But I digress. Let’s get back to the bowl recipe. 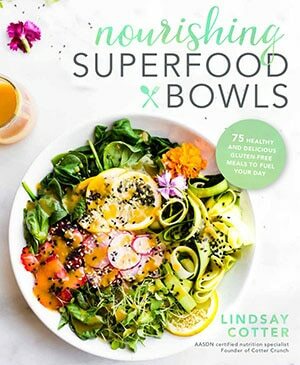 Cause you know I will forever be infatuated with Superfood bowl recipes. So let’s start this recipe post out with a little behind the scenes story. I’m going to tell you how this cauliflower risotto dish came about and why I’m excited to freely share it, cool? You see, I was reading this AMAZING devotional over at Proverbs31.org. I just love starting my day off with those words. Anyway, Jennie got me thinking. So often we strive to prove ourselves when we don’t need to. For me, I love my work and creating gluten free recipes. When it comes to business (food blogging, photography, and nutrition), or any important role for that matter, it can be easy to get wrapped up in the outcome. Will this recipe be pinned, shares, mentions, etc.? Will I be able to accomplish my goals this month? Whoa whoa whoa… that’s not why I (we) started sharing and creating recipes. Yes, stats and goals are beneficial, but do they define our worth or our value? ABSOLUTELY NOTE! They don’t define us. What does defines us? Our purpose and passion behind each action we take, in all areas! Cotter corniness seeping in here. Which leads me to this cauliflower risotto recipe. And my purpose. A guilt free recipe. As in, I did not plan this recipe for performance. I did not spend oooodles of time photography or trying figure out the right SEO title. I did not make this for my handsome Kiwi dwelling husband (sorry babe). 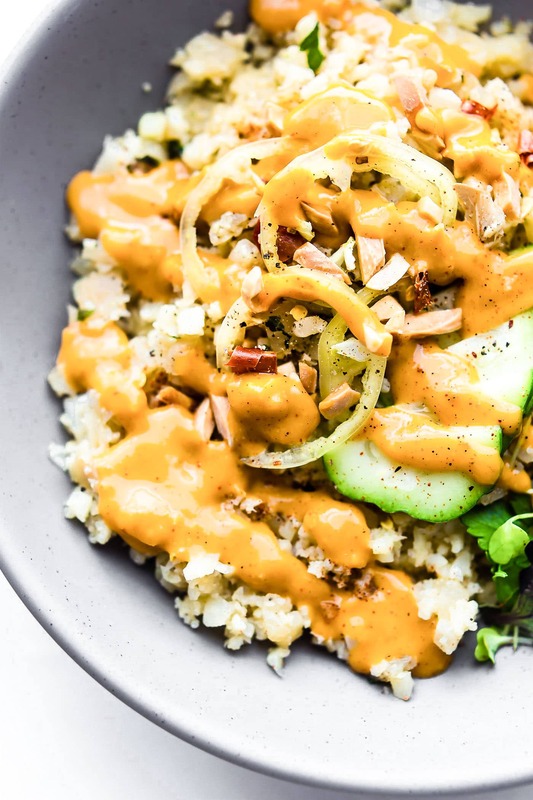 I made this guilt free cauliflower risotto bowl recipe with chili garlic avocado sauce totally on a whim, because I wanted to. I night to myself and a bottle of wine might led to a Cotter Inspiration and major Craving. And you know what? It has become of our favorite meals (along with shrimp or chicken) to make. Which, again, is why I BEGGED my publisher to put it in my Nourishing Superfood Bowls cookbook. It must, I repeat, it must, be shared! Here’s my recap in a handy dandy video for ya! On another note, I don’t even know if this should be categorized as risotto, but I’m going with it. Cause I WANT TO. LOL! Cauliflower Rice has been our to go veggie lately. Plus there’s the fact that I wanted to try use up more of our CSA veggies. Like chili pepper, jalapeños, herbs, and all the avocados! Um, ya… more spicy avocado (avocado-y? Ya, that’s a word) sauces recipes please! 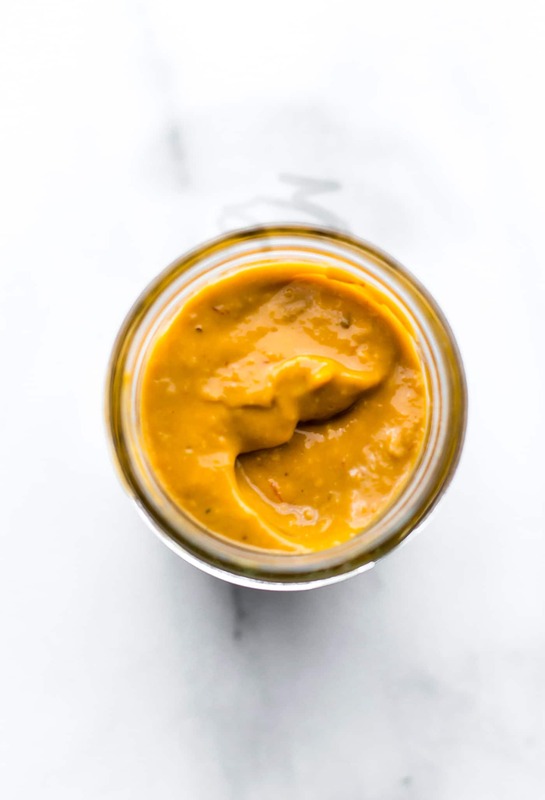 Bonus, this extra spicy avocado chili garlic sauce rocks with wok fired shrimp or salad Highly recommend making a jar full to put on everything. Mmm k? 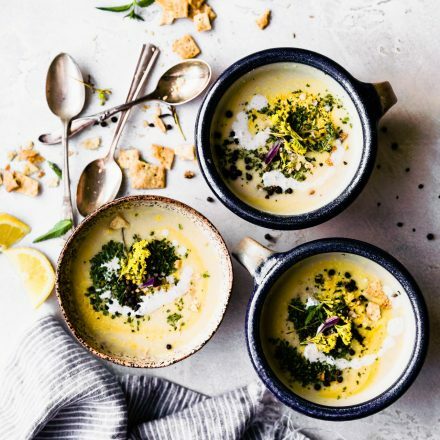 Craving on a whim aside, this no pressure zone recipe actually does serve a nourishing purpose. Ready? A Nerdy Nutrition Tip Comin At Ya! Nothing to prove but a cauliflower superfood coolness factor. Cauliflower contains a good source of choline, a water soluble B vitamin similar to other vitamins, such in the B vitamin complex family. This is vitamin is super important for pregnant women as this B Complex (folic acid included) boosts brain development. And no I am not pregnant. Just a nutrition nerd. Now, if you are vegan or vegetarian this is cauliflower risotto is also beneficial, nutrient wise! Why? Because normally choline consumption comes from eating eggs, beef, fish, etc. But CAULIFLOWER (along with some other legumes) is another great choline source that you can easily STOCK UP ON! Like say in multiple bowls of cauliflower risotto. Better yet, if you are paleo, just throw some beef liver and egg on these bowls and have yourself a Choline Hay Day! Hey, I’m all for more Choline health benefits. Increased brain function (yes please), energy, anti-inflammatory response, and better digestion. Speaking of brain function. I’m ready for my brain to share this cauliflower risotto recipe before it loses momentum. Gah, felt so good to share this no pressure Cotter creation. These Chili Garlic Cauliflower “Risotto” Bowls are an easy Paleo/Vegan dish to satisfy that comfort food craving! A healthy comfort food recipe with a spicy sauce. First make the dressing. Simply blend the chili sauce, avocado, pepper, garlic, and, coconut milk. Once blended add in your spices tamari or worcestershire, honey/agave, and ginger. You can thin our the avocado chili sauce by adding in 2-4 tbsp of water or coconut milk, and a little oil. Mix until texture is thinner. If you want it sweeter add in more honey or agave. Chop leaves and stems off cauliflower. Place all or half at a time in food processor. Pulse until “riced”. Remove and set aside in bowl. Chop onion and peppers. In a small pan, heat garlic, oil, and onion. Saute until fragrant. 1-2 minutes. Add in cauliflower risotto rice and red peppers. Cook on medium for 2-3 minutes. Add in 1/2 c almond or coconut milk. If you want a creamier salad, add in 2-3 tablespoons more non dairy milk or coconut cream. Remove from heat. 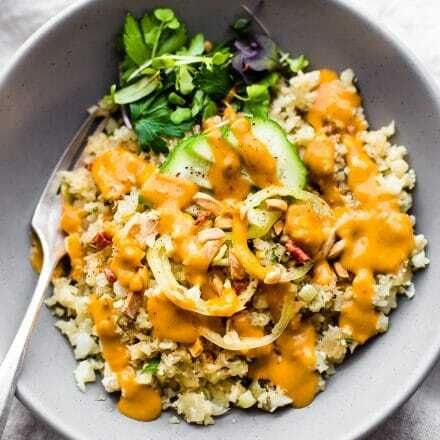 Place riced cauliflower risotto in large bowl. Top with sliced green bell peppers, chili peppers, chopped basil, crushed nuts, slice cucumber. Drizzle chili garlic cream sauce over each bowl when serving. there should be extra sauce for other uses. This dish is great as a side or top with protein of choice – tofu, grilled shrimp, chicken, meatballs, or even egg! I love adding in extra greens on top to garnish too! If you are looking for to make the paleo chili sauce to whole 30 compliant, Nom Nom Paleo has one on her site. Omit honey in the sauce if using as a whole 30 recipe. 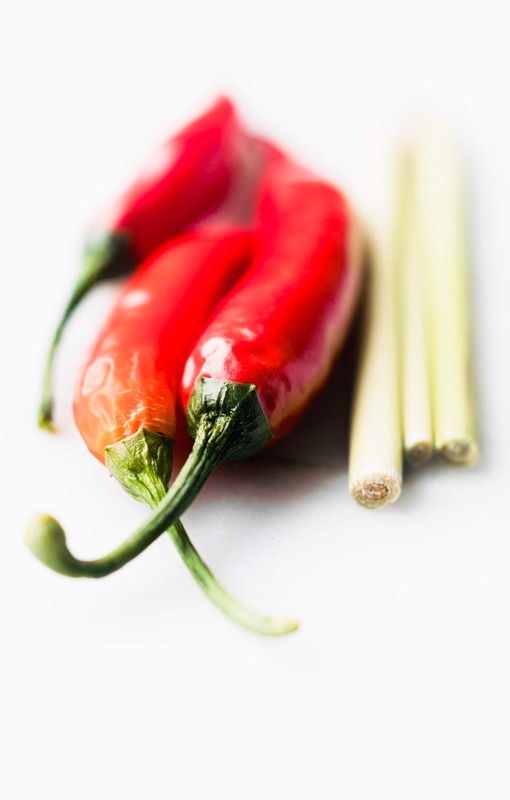 TIPS FOR COLOR of SAUCE – Depending on the type of chili sauce you use, the color can turn out red, green, or orange. I used a sweet chili sauce similar to this brand. 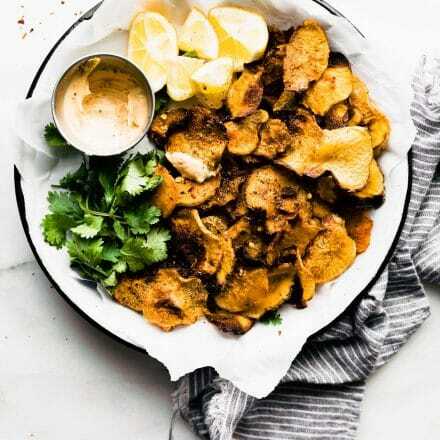 This dish is AWESOME as a side or top with *protein* of choice – tofu or chickpea, grilled or baked shrimp, salmon, chicken, meatballs, or even eggs! 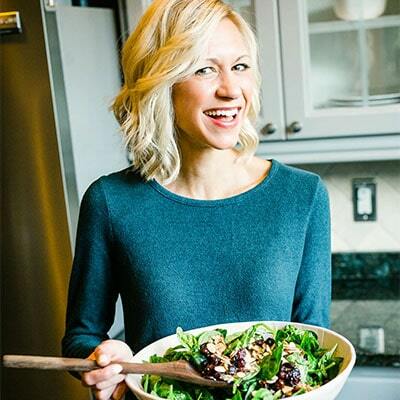 Today’s guilt free cauliflower risotto recipe post consisted of random rants, gratitude, and nutrition tip to fuel you along!. Ya, welcome to the inside of my brain. You’re welcome. Ever tried cauliflower “risotto?” What’s one thing you are grateful for today? Stay tuned! In a week we will be giving away a 6 Nourishing Superfood Bowls cookbooks for my 35th bday, plus a ton of other goodies on instagram. You will love this! Mwah! Lindsay, are you a fan of Cauliflower? 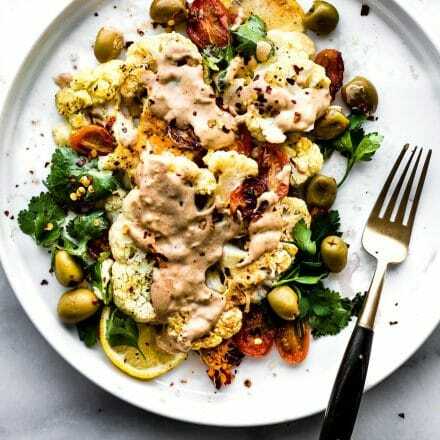 This is the third cauliflower recipe that I am seeing on your site. But this is something which tempts me a lot as you had used great flavors! 🙂 Let me add this for my weekend. haha yes, it;s my cheap and easy “rice” staple when I don’t have time. My husband is also on a low carb kick, so this helps. Nothing about about stats or SEO drives me. I only want to help people but sometimes I don’t feel like I like im enough. I would say you are MORE than enough and MORE than helpful, you are AMAZING! can i just say that stats don’t matter when you are so real and honest and EXTREMELY encouraging as a coach, as a friend, and as someone going through IVF or crohns. Really, truly, I heart you so! Duuuuude… You know I’m a cauliflower-creation junkie, but that sauce. I’d roll around naked in it (don’t tell Vegas). I’m pretty pressure-free with the cooking. The birthday cake I made Vegas was some pressure, but it was still fun. For meals, I know that if I eff it up, we’ll just walk down the street for Mexican of Whole Foods. HAHA! let’s start a cauliflower junkie restaurant! LOL! I think I would smother it on everything. OMG the sauce. . . you mean it’s not melted Velveeta?! 😉 I would probably have to grill some shrimp to put on top of this bowl of deliciousness! Wow the recipes you make for yourself are really amazing looking; I love pressure free meals. I’m not quite to that food styling yet, but I love learning from you and salivating over all the deliciousness that is every single one of your meals/treats/desserts/snacks. That garlic cheese saaaaaaauce aaaaaagh! 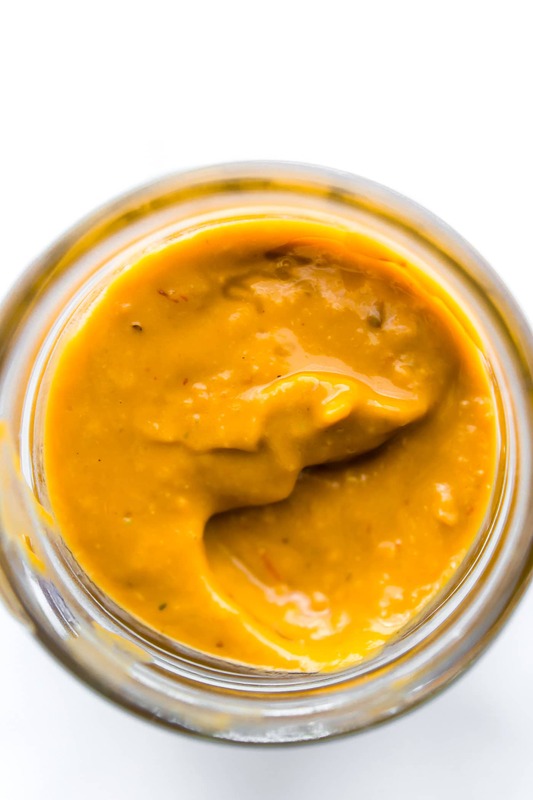 I LOVE that you made the sauce using avocado and coconut milk – it sounds and looks so amazing! Definitely the perfect guilt-free yet mouth-watering accompaniment to this bowl. 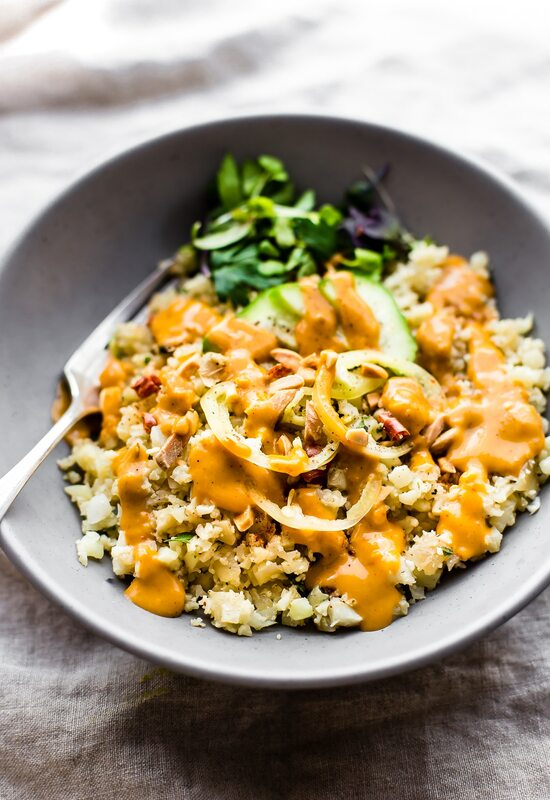 Love everything about that cauli risotto…I truly must make this asap! it’s UNREAL good julia. I know you’d approve. well, hopefully. LOL! YES to guilt free & just for you!!!!!!!!!!!! I had no idea coconut aminos even existed. 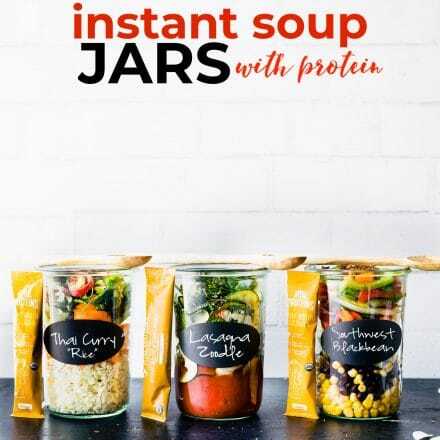 I need to find some asap….I had written off aminos entirely b/c of a soy allergy, but this is gonna rock my kitchen. Also, I need one of these bowls for dinner tonight. haha thanks friend. It was actually a quick shoot. Meaning, no other pictures besides the bowl. No cool “process” shots. Lord have mercy it was freeing. Sadly. First – i loved that specific devotional too!! it was so good. and THIS, looks amazing!! I love aranccini and this is such a good spin on it! It’s amazing how easy it is to get caught up on the numbers instead of our original blogging purpose. Thanks for the reminder…and the delicious recipe! 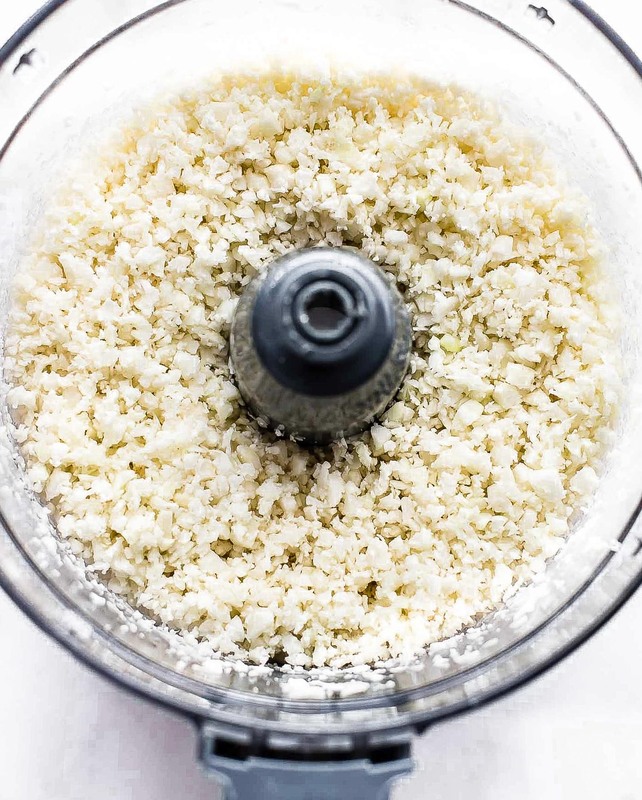 Cauliflower rice is seriously one of the coolest food finds ever. Looks delicious Lindsay! I love how healthy and easy this recipe is! That sauce on top looks UNREAL!! Need to try this recipe!! For sure linz! Keep me posted on if you do! Hey! If I’m using frozen riced cauliflower, should I cook it as the packaging says and then add it into the pan? Or should I just defrost it? I would cook it prior. Just so you can squeeze out any extra water, if that makes sense? I am really excited to make this for my family, however; we have one that is very allergic to avocado. Do you suggest a substitute for the avadaco? Oh sorry to hear. Can you have nuts or dairy? We’re vegan so nuts we can have! I looked through all the positive comments, but found that no one had actually made it. I made the sauce today and am amazed how you can have an orange sauce after putting an avocado in it! Mine came out an army green – when you mix red and green, the result is NOT bright orange. OK, so much for that. The sauce just didn’t have a good taste. I upped the heat with sriracha, but it just got hotter and not any more flavorful. I added a little more of this and that, but nothing helped. Hi Caroline. Thank you for feedback. I appreciate your honesty. I’ve had several people make it, I can give you their info if you’d like. I totally understand on the chili garlic sauce. It really depends on the type of chili sauce you add. Mine overpowered the green. If you use Sriracha it will be more green. I will make notes in the recipe. I’m sorry you had a bad experience. I will retest this again just to make sure. What interesting flavors. I added sliced mushrooms and toasted Tempeh cubes for an extra protein punch. Husband loved it. oh that sounds wonderful! Thank you for sharing those extra flavor tips! These are TOTALLY happening for dinner ASAP. Love that you used cauliflower! this is totally your jam! So creative! I have to make this! What a creative recipe! I can eat cauliflower all day, so there’s no choline deficiency for me! This looks amazing, my family will love it! Lunchtime perfection in a bowl! Love the fantastic flavors! I’ve never thought of making a risotto with cauliflower! .. Then again, I once made a pizza with a cauliflower “dough”. It didn’t go so well because I needed to cook it a bit more.. But it was fun to try. It’s never better than a conventional pizza of course, just healthier and fun to make.! I love everything about this dinner! Healthy and absolutely tasty! So much healthy goodness AND flavor in these bowls! Guilt-free risotto? SIGN. ME. UP! This is really great work of your team for making chilli garlic dish. Hi! I made this and my hubby LOVED it… am wondering how good the sauce keeps for in a sealed Mason jar? Oh yay! So glad! Yes the sauce should be good for a few days no prob. There are mandatory chili sauce to accompany the new delicious, the way below will help you complete the spicy chili sauce.